The revolutionary, award-winning underfloor heating system Schlüter-BEKOTEC-THERM was the natural choice for one of the UK’s greenest self-build projects. 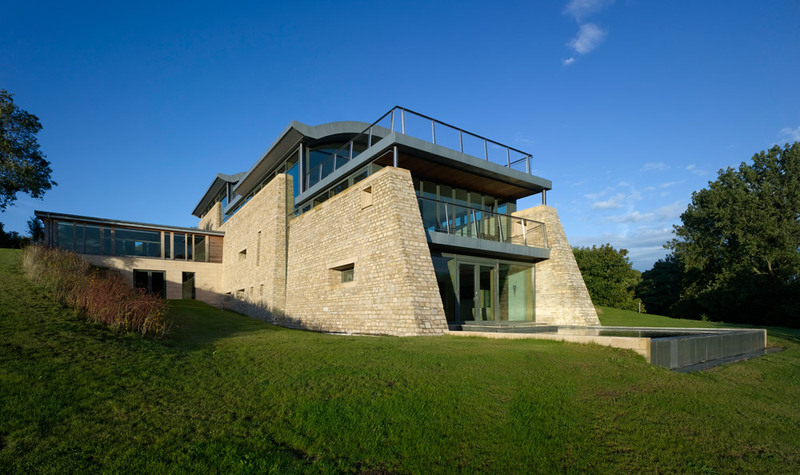 John Croft installed Schlüter-BEKOTEC-THERM under all 1,470 square metres of flooring at his luxury eco-house in the Cotswolds. And to uncouple the Jerusalem Gold stone tiles from the Cemex Supaflo anhydrite screed, the Schlüter-DITRA uncoupling membrane was specified. Known as The Moonstone Project, the unique multi-level six-bedroom house, which includes an indoor swimming pool, gym, cinema and games room, is a model of eco-efficiency, which is why the energy saving aspects of Schlüter-BEKOTEC-THERM were so important. And as the system incorporates the uncoupling membrane and a modular screed, it also protects the stone tiles. Many ceramic and stone tile installers have become wary of fixing over heated screeds because of problems experienced in the past with tiles cracking, splitting and debonding. This is caused by the screed and tiles expanding and contracting at different rates due to their different heat expansion co-efficients during temperature changes. However, Schlüter-BEKOTEC-THERM is an energy-efficient and quick-reacting modular assembly system which overcomes this long-standing problem with the formation of micro-fine cracks that eliminate stress build-up due to shrinkage during the curing of the screed. As soon as the screed can be walked on, the Schlüter-DITRA uncoupling membrane is bonded to it, and the stone or ceramic covering is then installed onto the membrane. And because the whole assembly has a low construction height, the screed mass to be heated is comparatively small, meaning the radiant heated floor is easily regulated and can be operated with low supply temperatures, giving reduced fuel costs. A thin layer of conventional screed – anhydrite, in the case of The Moonstone Project -- covers the studs and pipes by a minimum of 8mm and up to a maximum of 25mm, depending on the type of installation, so in some cases just five degrees is lost between the heat pipe and the surface. All of which means that Schlüter-BEKOTEC-THERM was the absolute right specification for Moonstone. Because 80% of the house’s energy is generated from flat plate solar collectors, with the remainder being generated by a ground source heat pump, the thin screed layer and the resulting lower temperatures needed to heat it, mean the heat pump works more efficiently than with conventional underfloor heating systems. And with 1,470 square metres of flooring to heat, John said it was essential that the temperature is easy to regulate. And there was an added bonus for the heating contractors, who found the entire system quick and simple to install. 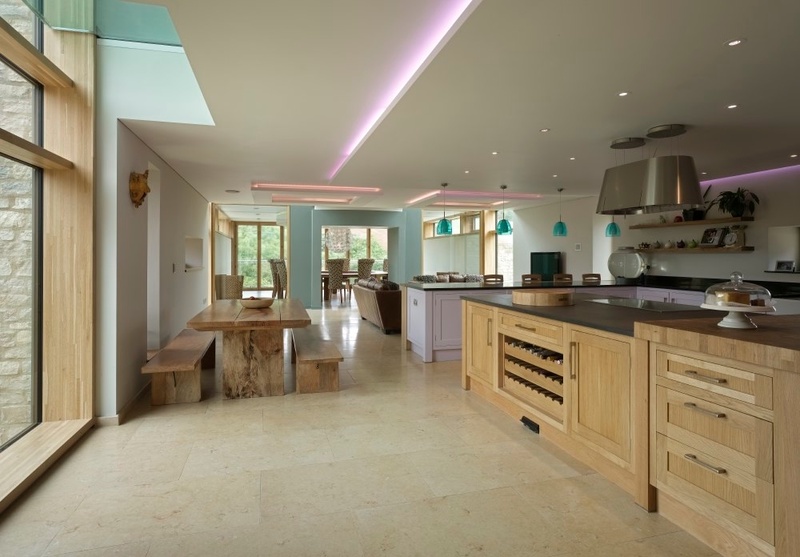 Although early architectural work on the house was handled by an architect, John completed the designs himself, and liaised regularly with Schlüter-Systems Ltd regarding the specification for the underfloor heating. The house in The Moonstone Project has a U value of 0.07, giving it a passivhaus rating. This means that in theory, the building is so well insulated that the heat given off by the people inside would be enough to heat it. The house has, on average, around 0.5 metres of insulation incorporated within its walls, floors and roof. The stone tiles were supplied by Indigenous Tiles, of Burford, Oxfordshire. They have been used internally throughout the whole house, and on three exterior balconies.